just how bad are the mosquitoes in the Yukon? Hi! It’s been a while. Remember me? We are currently in Florida working in the panhandle with Samaritan’s Purse for the Hurricane Michael recovery efforts. You are welcome to hop over to my Instagram Page and view my daily stories to see more about what that is like (be sure to say hi while you are there). Where are you at? I’d love to hear what you’ve been up to since my last post! Today I am going to do a time hop back to a post that I wrote in route to Alaska this last summer. I’d waited to post it until Trent had time to edit the accompanying video. I hope you enjoy! 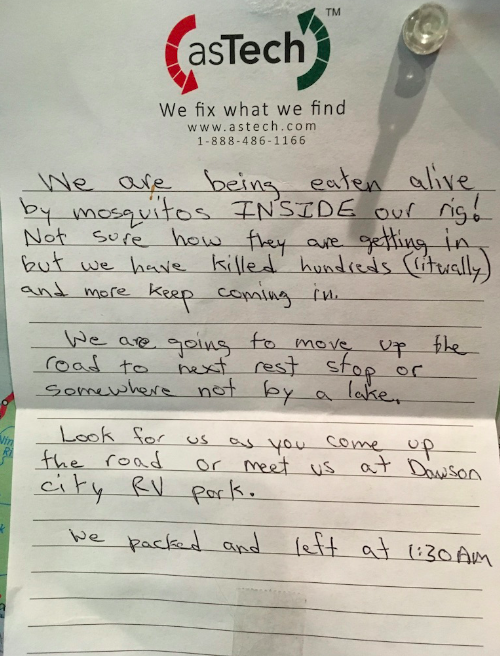 When we started telling others about our plans to spend the summer in Alaska, one subject inevitably surfaced again and again: mosquitoes. People really felt it was important to let us know how bad they were. Trent grew up in Minnesota, the land of 10,000 lakes and millions of mosquitoes. We’ve been to the Everglades! However, we haven’t even crossed the border into Alaska and we’ve already learned some major mosquito lessons. Just how bad are the mosquitoes in the Yukon? You be the judge. We had an agreement people! The mosquitoes did not keep up their end of the bargain. Somehow the little suckers found secret entrance points into our home and invaded our sacred space. As our internal mosquito ratio incrementally escalated, so did concerns of our evening sleep and thus began our defense mechanisms. And yet, despite our arsenal of protection, the miniature insects held the firm upper hand. At 1:30 AM I heard our front door open and noticed that Trent was no longer in bed. “What in the world is he doing?” I wondered. I climbed out of bed and he came inside holding a note in his hand. “We are moving,” he said. And thus began our earliest travel day to date. And away we went, searching for anyplace that the mosquitoes might have forgotten about. -Ashlyn asking if she needed to start her morning responsibility list. -Tanner sitting in his booster seat wrapped in his sleeping bag. -Quinten falling asleep in the truck with his blanket draped over his head. All the while, the sun is so strangely along for the ride, hanging low in the horizon unwilling to miss out on this adventure. Down the road, we stop, assess the insect population and press on. About an hour later we discover a rest stop with approximately 75% less mosquitoes. We drop anchor and begin the eradication process within the RV. Thirty minutes later we crawl into bed, exhausted and still slightly outnumbered. We’ve since recovered both emotionally and physically. Trent has identified some key areas that may have been entry points and spray foamed the future possibility out of existence. We also may or may not have ordered mosquito netting to cover our beds in the event that we find ourselves in a future series of unfortunate events. Some of you may read this and say, “Well, you are headed to Alaska, what did you expect?” Honestly, I knew it might get bad, but this, this home invasion, sleep disturbance, midnight attack, was not on my radar. Although nothing can fully prepare you, at least I have the grand pleasure of video evidence of our memorable mosquito evening to entertain us well into the future (accuracy note: Trent makes it sound like we were in Alaska already when this happened but we were still in the Yukon.). Your turn! I want to hear your worst mosquito encounter. Where were you? When was it? Details please, I want to know I’m among friends here! Hi there! It has been a long time and I was wondering where you were recently! How awesome that you’re helping out in Florida! Our worst mosquito experience was while taking a 4-wheeler sunset tour up a mountainside outside of Fairbanks in August 2016. We were bundled up and our faces covered with helmets so it was fine until you stopped and lifted the helmet for a picture or took off a glove to adjust something. Felt like they were going to literally lift us off the ground and carry us away! The view of the Denali range from there was beautiful, though! ok that sounds HORRIBLE! I am so glad you were covered!!! It sounds like an amazing vantage point however! 🙂 Thanks for sharing! Hi! I have been to the Yukon, Alaska, Minnesota, and the Everglades. However, the worst experience with mosquitoes by far was when my wife and I attempted the Zumwalt Meadow Trail in King’s Canyon NP. Attempted being the key word here. It was a beautiful day in June of 2016. We parked at the trail head and prepped for what should be a short hike. The water level was very high due to the spring melt. There was a very heavy snow fall that winter. We were putting on our hiking boots and noticed a few mosquitoes so we put on some spray. Temperature was probably in the upper 70s to 80s and it was the middle of the day. We were wearing shorts. Across the way another person pulled in to the parking lot. It appeared she was going hiking too. Then she pulled on some long waders and put on a heavy overcoat. Well maybe she was going fishing in the river which is probably very cold due to the snow melt. Finally, she put on a head covering complete with mosquito netting that came down below her shoulders and added gloves. That seemed a bit extreme to me. We started off on the hike. A few hundred yards into the hike there was a sign posted that that the meadow the trail went around was flooded. No problem, we would just go as far as we could and then return. We continued on. The mosquitoes were getting worse. A little further on we crossed the river, then entered the woods. Now the mosquitoes were everywhere. Walking quickly did not stop them from attacking. We soon left the woods and broke out into the sun again. This should help I thought. Sunlight and heat should slow them down. I was wrong. All the mosquito spray, sun, swatting, nothing would deter these mosquitoes. Finally, we gave up the hike. We never got to the point of the meadow, where the trail was flooded. On our way out we passed the lady fishing along the river. She didn’t seemed bothered by the mosquitoes at all. She was well prepared. Her preparation no longer seemed extreme. I had a new perspective. Never did we expect anything like this, we pursued a couple of other hikes in KCNP and never had any more mosquito problems. Just this one hike. We did purchase some mosquito head coverings to take with us for future use! We just met you guys as you were leaving the Walkers at YWAM. I loved your blog, but I must admit, gave me another reason not to go to Alaska! 🙂 Hi guys!! I understand your thoughts! Keep in mind that once we actually got TO ALASKA we had very little issues. We heard from friends that went north to the Arctic Circle were successful in finding mosquitos there however!